All Progressives Congress (APC) stalwart Asiwaju Bola Tinubu yesterday advised Nigerians not to accept the apologies tendered by the People s Democratic Party (PDP) for its mistakes while in power. Speaking at his 66th birthday’s colloquium in Lagos, the former lagos State governor described the apology tendered last week by PDP National Chairman Uche Secondus as “deceitful”, meant to hoodwink Nigerians to get a political advantage. He said the apology cannot change the effect of the damage already done to the economy. ”Nigerians should not accept PDP’s apologies, they are corrupt, they lied, they falsified, they changed figures. “For 16 years, they made fake promises, gave us fake figures, and they tell us, ‘Don’t talk about it’. 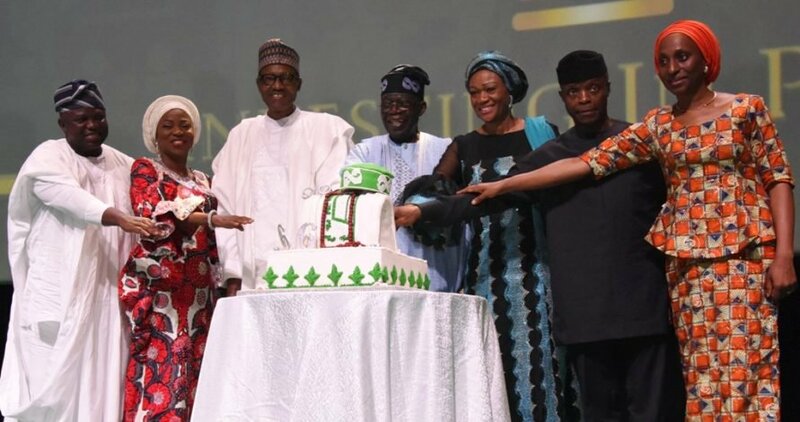 At the colloquium, which is the 10th edition, were President Miuhammadu Buhari, Vice President Yemi Osinbajo, host Governor Akinwunmi Ambode and many other governors, lawmakers, ministers, past governors, past ministers, traditional rulers, top industrialists and other categories of people and associates of the celebrator. The former governor also chided (although without making direct reference to him) former President Olusegun Obasanjo for writing a letter advising President Muhammadu Buhari not to contest in 2019, besides castigating his administration. Tinubu said it was was full of bile. He added: “My grandmother used to send me to a letter writer. Someone is writing letters these days, a letter of politics as if they have never been there before. Bad belle letters. An excited Tinubu was full of praises for the President, the vice president, governors, legislators and other dignitaries who came to honour him. He also thanked his wife, Oluremi, “for tolerating hme”, adding that she had no choice. He applauded Ambode for his exceptional commitment to the progress and economic development of Lagos State. In an obvious reference to the endorsement of the governor for a second term by stakeholders, Tinubu said after many work, “the result is more work”. He also hailed the cordial relations between the governor and his deputy, Dr. Idiat Adebule. The former governor traced the genesis of the Buhari administration to the epic battle to effect a change in the polity, stressing that Nigeria has reaped the dividends. Tinubu disagreed with people who said the APC should stop reminding Nigerians about the corrupt activities of the Jonathan administration. He said a great lesson could be learnt from the perfidy of the former ruling party. Tinubu, who thanked Nigerians for their patience and support for the APC government, said the PDP should not return to power to continue what he called the looting of the economy. He added: “Forget those parties. They won’t come back. We did not envisage that there would be no such challenges. So, we report back to Nigerians about what we found on ground. We did not say that there would be no challenges because, even America is facing challenges. Tinubu, who spoke on the importance of a re-invigorated pension scheme, promised to write prepare a technical paper for the President on the crucial matter. He added: “The challenge of the economy is on. We should consider micro-credit. We should return to the mortgage culture to reduce corruption. We need to rework the pension. I will submit a proposal on how we can stimulate the economy. We don’t have to pay for a house of N10 million in one day and with cash. We need mortgage. This would discourage corruption. As Tinubu was called to the podium, his supporters in the hall launched it a song: “On your mandate we shall stand” Ambode joined to sing the song. 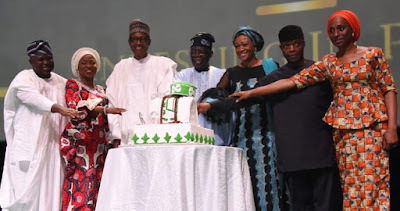 President Muhammadu Buhari, who chaired the event, acknowledged the celebrator as a “strategist” and “a fountain of ideas”, adding that he is a party chieftain and a friend whose care for the people and contributions to the progress of Nigeria and Africa should be appreciated. The President arrived at the venue around 11.30 am, after inaugurating the Ikeja Terminal Bus Stop. He flew in a chopper from the Presidential Wing of the Murtala Muhammed International Airport to the Victoria Island venue. He was accompanied by host Governor Akinwunmi Ambode, his wife, Bolanle, Mrs. Idiat Adebula and some ministers. The colloquium’s theme is “Investing in people”. Some beneficiaries of the Federal Government’s social investment and school feeding programmes shared their experiences, stressing how the programmes had impacted their lives.